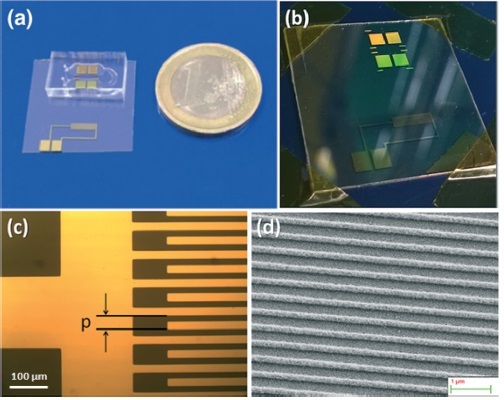 A surface acoustic wave (SAW)-enhanced gratingcoupling phase-interrogation surface plasmon resonance (SPR) microfluidic biosensor. 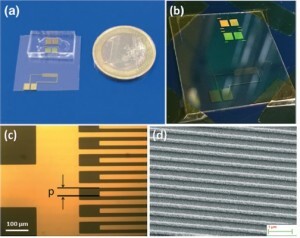 A surface acoustic wave (SAW)-enhanced, surface plasmon resonance (SPR) microfluidic biosensor in which SAW-induced mixing and phase-interrogation grating-coupling SPR are combined in a single lithium niobate lab-on-a-chip was demonstrated by Matteo Agostini, Marco Cecchini and co-workers, Istituto Nanoscienze – CNR and Scuola Normale Superiore at NEST Laboratory. Thiol-polyethylene glycol adsorption and avidin/biotin binding kinetics were monitored by exploiting the high sensitivity of grating-coupling SPR under azimuthal control. A time saturation binding kinetics reduction of 82% and 24% for polyethylene and avidin adsorption was obtained, respectively, due to the fluid mixing enhancement by means of the SAW-generated chaotic advection. These results represent the first implementation of a nanostructured SAW–SPR microfluidic biochip capable of significantly improving the molecule binding kinetics on a single, portable device. In addition, the biochip here proposed is suitable for a great variety of biosensing applications. More detail on Lab on a Chip Journal, HERE.